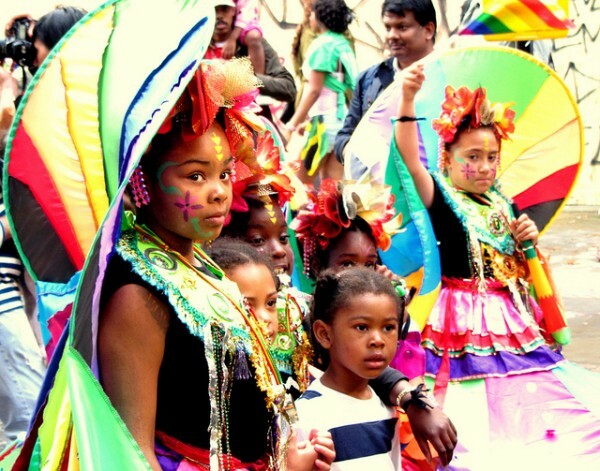 The carnival company and arts charity Sunshine International Arts has launched a crowdfunding campaign to take 35 local disadvantaged children to Notting Hill Carnival. The charity says it sees the carnival as an opportunity to inspire children: to express themselves, to engage with craft and to be the centre of attention. “We went (to Notting Hill Carnival) as part of the troupe organised by S.i.A and it was a really incredible experience… It was so exciting for all the kids to become the centre of attention in their amazing costumes. Some of the young completely revelled in becoming a celebrity for the day, waving to the crowds and even having people along the route asking to have their picture taken with them”, said Grace Lally, former Chair of the Loughborough Estate Tenants and Residents Association. Based in one of the poorest wards in London, S.i.A’s headquarters C.A.F.E Carnival-Arts-For-Everyone, in Loughborough Junction, focuses on education, local investment and increasing diversity in carnival arts. Unable to contribute towards their transport and costume, many local children miss out on the experience. The money raised will go towards the children’s costumes and transport. Having participated in Notting Hill Carnival since its creation in 2002, the company says it is committed to making the experience a memorable one for children and young people. The campaign will run throughout the summer and those who contribute will enjoy prizes such as lunch for 2 at Sunshine International Arts’ headquarters C.A.F.E (Carnival-Arts-For-Everyone), T-Shirts from previous carnival productions and homemade Caribbean chutneys.